Ushida Findlay is an active architecture studio based in north london, UK. The former practice went into voluntary liquidation in June 2004 – see lower down this page for details. Ushida Findlay (also known by some as Ushida & Findlay Architects) work is characterised by plasticity: one of their most noted works is the fluid, organic project entitled Truss Wall House. However, the fluidity and boldness of the Japanese projects does not seem to have been expressed in their Homes for the Future housing. This housing project is orthogonal save the semicircular balconies. The Ushida & Findlay building is reminiscent of CZWG’s Cascades, Isle of Dogs in basic massing and is probably designed to harmonise with the adjacent building heights onto Glasgow Green and then softly step down to the internal postage stamp of greenery, out of some kind of respect. Ushida Findlay were however also working on a Maggies Centre in Wishaw (now carried on by Reiach and Hall Architects, Edinburgh) and Granton Strand, Edinburgh so we will await with relish whether they can show more integrity with their oriental legacy. Ushida Findlay went into voluntary liquidation in June 2004. Ushida Findlay were working on three projects in Doha, Qatar which had experienced delays and cash-flow problems. Twenty three architects were working for the architectural practice based in London. Kathryn Findlay, was the daughter of an Angus sheep farmer but went on to great things, invited to the Venice Biennale, and Professor of Architecture at Tokyo Unversity. Findlay graduated from the London AA in 1979. Recently Kathryn made her name with a starfish-plan design for a country house in England – Grafton New Hall. Ushida Findlay gained this project by winning the Royal Institute of British Architects’ competition in 2002 for a proposed English country house. The developer of Grafton New Hall intends to use the starfish design with a new architect. Kathryn Findlay became an honorary architecture professor at Dundee University in 1999. Kathryn received an architecture scholarship from the Japanese Ministry of Education for postgraduate research at Tokyo University. Apart from Wishaw and Granton, Ushida Findlay were working on projects in Doha – a Museum and two grand houses, one for Quatar’s Minister of Culture. As well as the problems in Quatar, Ushida Findlay Architects’ £4m arts centre was halted by Bury St Edmunds Borough Council in April 2004. 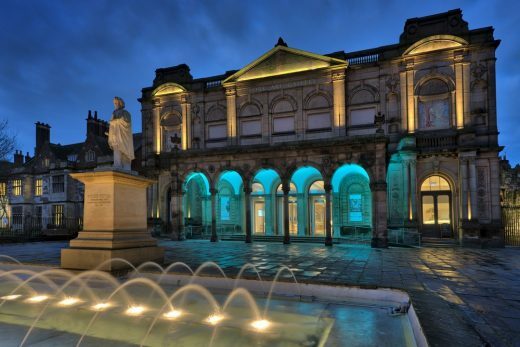 Ushida Findlay had won another Royal Institute of British Architects’ competition converting the Corn Exchange in Bury St Edmunds, Suffolk. Ushida Findlay also lost the Plymouth University Competition in 2004 to design their Faculty of Arts & Humanitites building. An English project Stade Maritime Landmark project – visitor centre and restaurant – in Hastings, West Sussex was won in 2002 but Kathryn Findlay was dropped in 2003. Kathryn Findlay is the Scots-born half of architects Ushida Findlay. Over the last 13 years Kathryn, along with her partner Eisaku Ushida, has been responsible for designing some of the “most appealing visions to emerge in some decades” as well as also enjoying a spell as the first women Assistant Professor of Architecture at the University of Tokyo. Kathryn Findlay has an intuitive intelligence for what she calls ‘poetic space’ for the possibilities inherent in translating the idea of landscape into buildings and interiors. Kathryn will explore the journey of discovery from concept to completion in Japan, the UK and around the world. Penny McGuire in AR1257 describes Ushida Findlay buildings as all being “products of a quicksilver originality”, drawing on “dream-like, poetic impulses to unsettle and delight”; they have a “habit of borrowing ordinary materials and using them in ways that challenge perception of them”. May 30, 2016 in Architects.